Removable power cord and plug outlets make installation easy. For use with process-type ORP and conductivity sensors; ordered separately. Two water meter inputs, ORP and conductivity sensor inputs, flow switch input, four relay outputs, and Power On/Off switch in a NEMA 4X enclosure are all standard features. 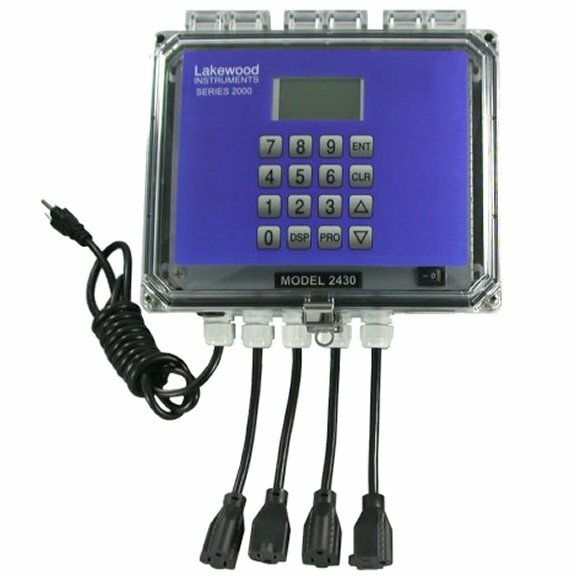 2430Pe LONWORKS Technology-based controller with 4 selectable relays for HIGH/LOW setpoints or alarms. Controller includes power cord and outlet receptacles. Requires ORP and conductivity sensors (530-4, and 540-4 or 543-4 series) which must be ordered separately. -35L Two 4-20 mA output configurable for data acquisition of conductivity and ORP. SEE THE 530 SERIES FOR PROCESS ORP SENSORS, AND THE 540 SERIES OR 543 SERIES FOR PROCESS CONDUCTIVITY SENSORS.